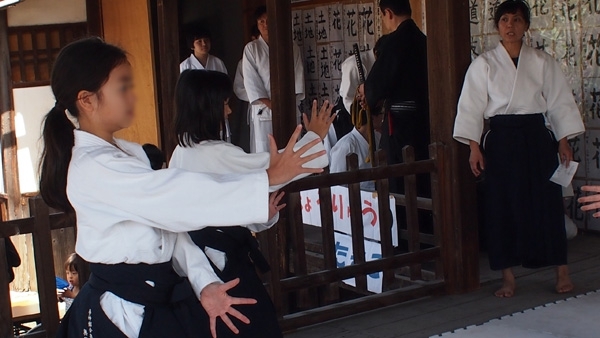 all the situations that happens in real life.since we recognise that is impossible to correspond to all that situations,we study the essence of fighting through kata-geiko(fixed techs). however the situations above are deterministic dangerous.nobody can correspond easily.the best way would be to avoid that kind of situations before happened. 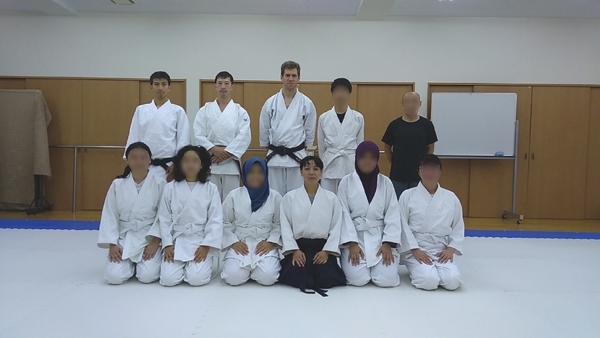 therefore we try to be polite,try to respect together,,,with brushing up personality,aim to be modest,aim to be friendly for gettiong to know the way of making no enemy through practice of aikido. 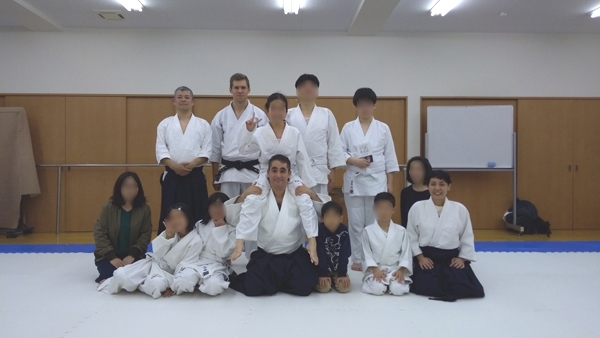 塩田剛三先生の高弟、ジャック・パイエ先生の道場です。Gozo Shioda's student Jacques Payet's dojo. 正しい姿勢がわかりますyou will get to know the right posture. 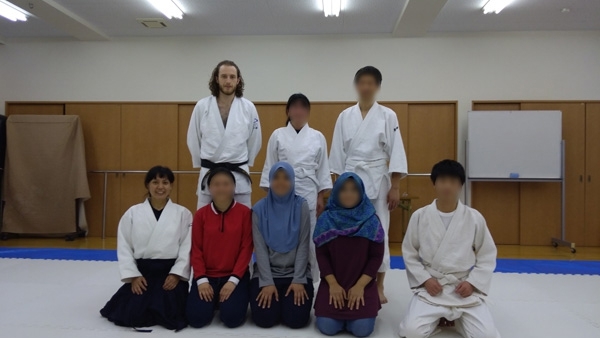 日本の文化、思想を学べますyou will learn a Japanese culture and a philosophy. 第19期国際専修生。故・中島孝雄先生（警視庁）、三枝龍生先生（三枝合気）に師事。更なる技の研鑽のため、ジャック・パイエ先生の下で修行中。19th international sensyusei(honbu).learned from Takao Nakajima sensei(the teacher of tokyo riot police) and Ryusei Saegusa sensei(Old Yoshinkan uchideshi).to develop the skill more,learning from Payet sensei. また、海外にも広く普及し、合気道を通じて特別な友人関係を築くことができます。the benefits of Yoshinkan Aikido is that tech are standardized and are splited in each parts.therefore it is easy to learn for beginners even old,young,woman,child or anybody.it is spreaded all over the world,you can make good foreign friends. 最初に学ぶ動作です。ファイティングポーズではなく、自分の中心に強い軸を作り、身体を練る鍛錬法です。正しい姿勢がわかると、普段の生活でも姿勢が正しくなります。生活すべてが武道の修行と気づき、人生が一変します。the basic of basics.this is not a fighting pose,but the method of training the body by making strong axis on your centre.for knowing the right posture,you will also keep a good posture in your usual life.by doing that,you will get to know that the life is the Budo. 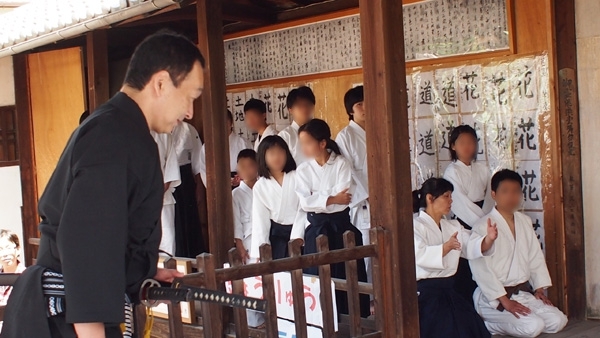 構えで培った強い姿勢を失わないように動く術を鍛錬します。剣の振りかぶる動作・切り下ろす動作を利用し、身体の芯を練っていきます。the training to keep on moving with the strong posture that trains by Kamae.by the motion of raiseing up and cutting down the swords,making strong axis in your body. 達人が到達した境地を型にして残したものです。技をかける側（仕手）とかけられる側（受け）に分かれ、協力しあいながら形を作り、型に秘められた技の本質を学びます。by working in pairs,and cooperateing to make collect techs together,we learn the eaasance of techs. 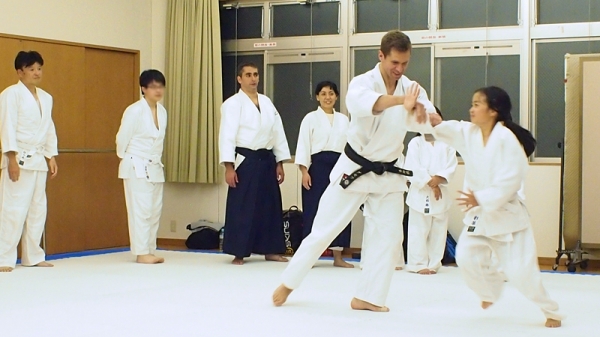 多くの伝統文化と同じように、最初に学ぶ「構え」こそが極意です。this is not like the basic techs,but applying free techs in motions. 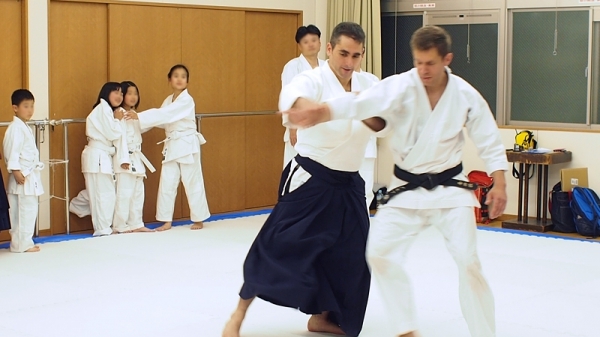 we always offer you a trial lesson.please feel free to ask. * this will be asked at only first time. 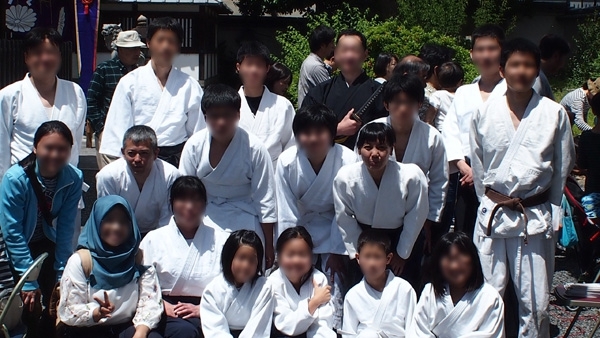 ※養神館門人とは、現在 養神館傘下の道場生のことです。* the yoshinkan member will be the member of other yoshinkan dojo. ※チケットの有効期限は6ヶ月です。* the ticket expiration date is 6month. ※チケットの他人への譲渡は禁止です。* to sell the ticket is forbiddened. ※チケットは、桂・長岡天神道場でのみ有効です。他の無限塾ならびに養神館の関連道場では、使用することはできません。* the ticket can be used our katsura dojo and nagaoka-tenjin dojo only. 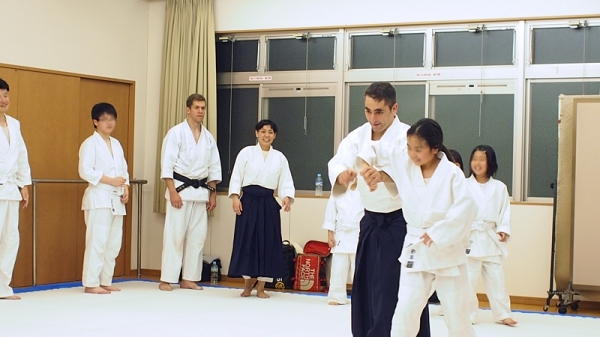 we are basicly holding the classes on Sat at Katura,on Sun at nagaoka-tenjin. 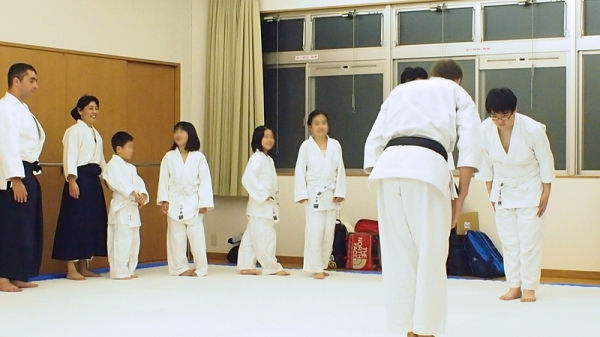 under 7years old child will be accepted,if parents works together. 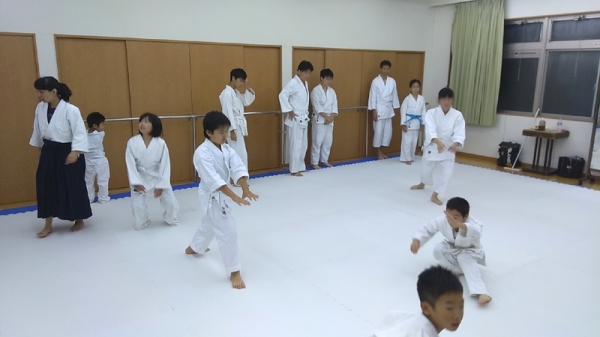 第三日曜日（朝）はお休みです。スケジュールをチェックしてください。third sunday morning is no class.please check the schedule. 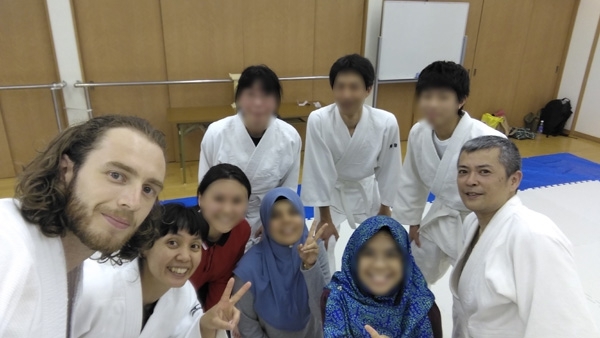 予約が取れない場合もありますので、スケジュールをチェックしてください。not every week.please check the schedule. 大岡まで。留守電にメッセージを頂ければ、折り返させていただきます。my name is Ooka.please leave your message.i will call you back. 差し支えなければ、おおよその年齢もお書き添えください。please let us know your age.